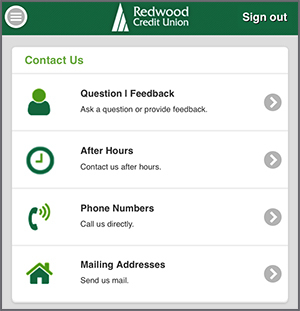 How do I contact Redwood Credit Union if I'm on my mobile phone? 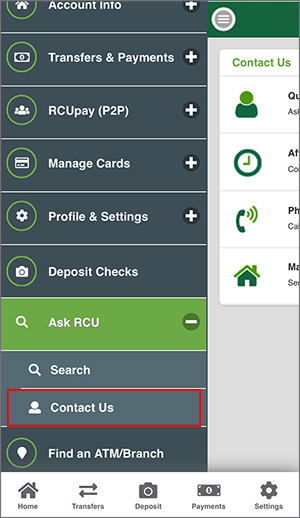 If you are using mobile banking, you can click on 'Ask RCU' from the main menu and select Contact Us. Choose the contact option that works best for you. Questions | Feedback: Ask a question or provide feedback. Note: Do not send sensitive account information. You can send a secure message in online banking. After Hours: Contact us after hours. Phone Number: Call us directly. Mailing Addresses: Send us mail. How do I update my phone number in RCU Online banking?